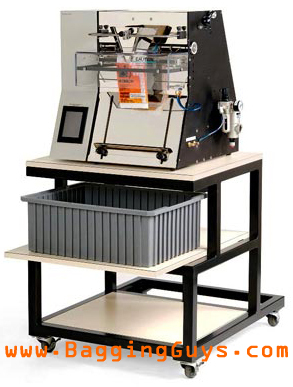 The T-300 bagger automatically feeds, seals, and tear-off pre-formed bags on a roll and will allow you to achieve MUCH HIGHER packaging rates than you get with an impulse bar sealer or zip lock bags! Includes digital controls for Auto (Paced Rate) or Manual (Foot-switch or Guard-Switch) cycle operation. Total Cycle Counter with Reset, Seal Time, Fill Time Delay and Seal Point. Set points are saved and automatically recalled when power is shut off. Call Us for Access to a T-300 Video!